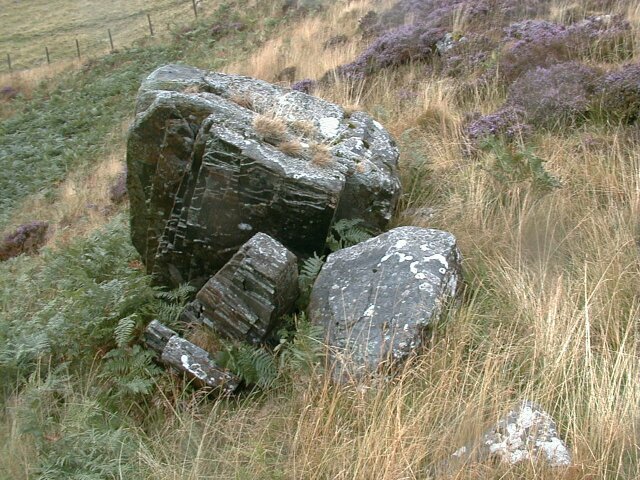 As may be imagined from my surname, I have certain links with Wales. But I hadn't been there for years, because it was in the opposite direction to other places I wanted to visit, and for other reasons . . . as well, I suppose, as a vague feeling that it would always be there, and much the same, so there was no hurry. 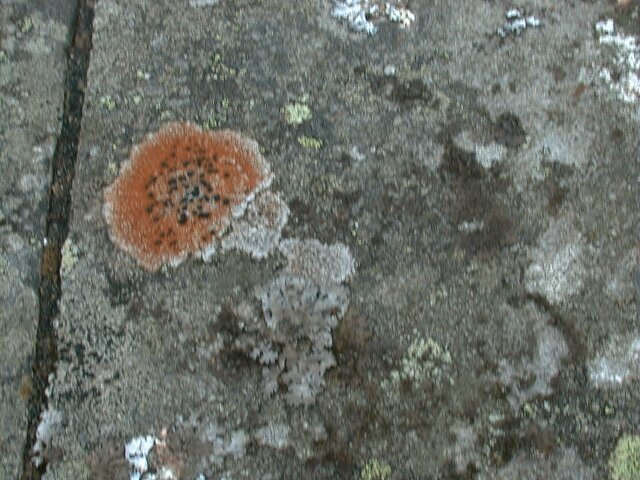 But this year (1999) I wanted to go; partly because I was urged to, and partly because I was seduced by The Matter of Wales by Jan Morris (whose prose could probably lead me to Duluth). I only had two nights in Wales. And of course it was cool and rainy. 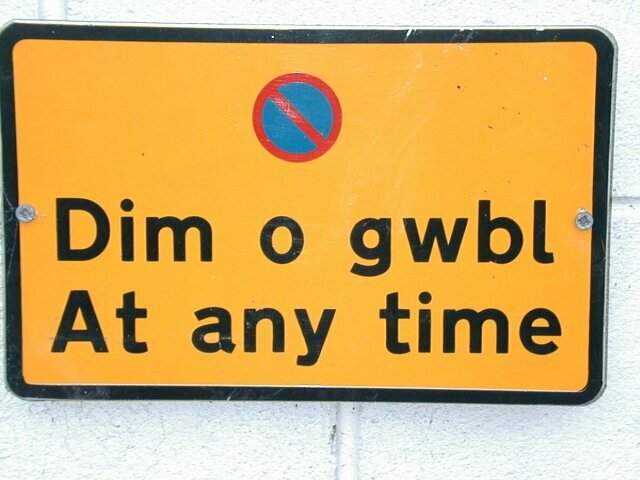 (Had it been hot and dry -- which allegedly does occur -- I'd have felt cheated of a truly Welsh experience.) So this little photo album is no great shakes. Still, here it is; to serve as proof to extraterrestrials or whoever reads personal home pages that, even if only briefly, I Was There. And I greatly look forward to going back. I wanted to go somewhere wild and spectacular, but not so much so that (in August) it would attract tens of thousands of tourists. The Elan valley area sounded just the ticket. 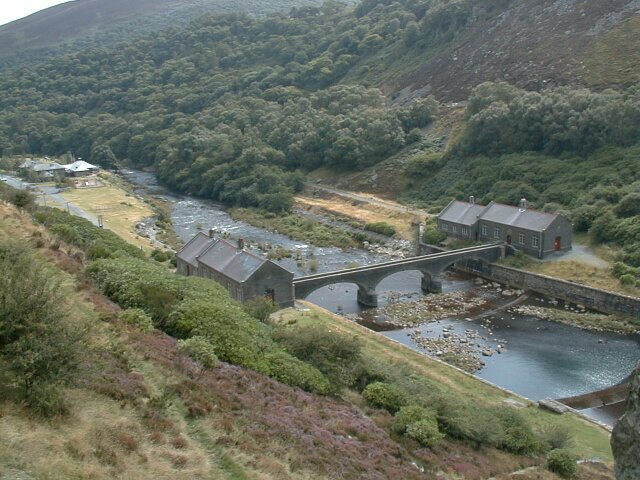 Rhayader sounded a convenient center (cf Thirsk for north Yorkshire), and the Rough Guide mentioned "a fine B&B" at nearby Gigrin Farm. 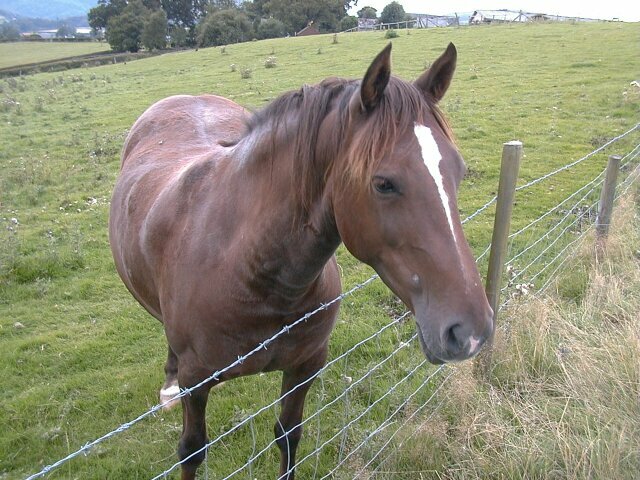 As it turned out, Gigrin Farm was much more. (Do see its own site.) Aside from farming livestock, this 80ha farm has animals aplenty (I was sorry to see no pigs, though) for the kids, a marked nature trail with a frog pond (though this wasn't a good time of year for that), and even resident badgers (viewable by CCTV) and red kites. 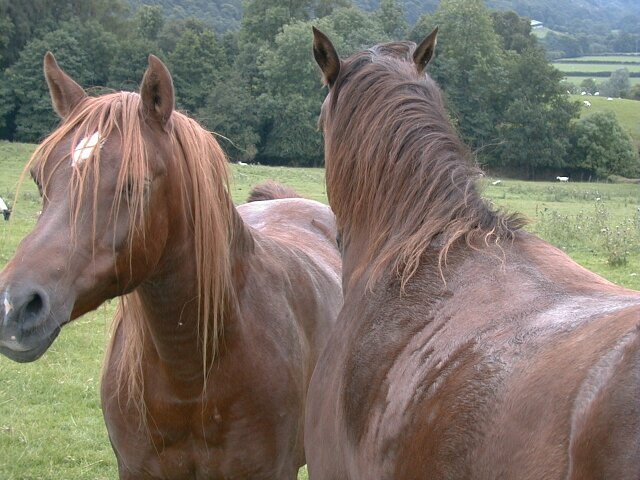 The horses were only moderately interested in us but very interested in each other. "I'm very sorry about that, sir. Your Vectra should never have been allowed to leave here in that condition. And I've upgraded you to a Rover. Nice car." "A Rover . . . mm, that's a downmarket BMW, isn't it?" "Um, no sir. Actually it's a Honda Civic." Behind it are the houses: rentable holiday cottage on the left; the farmhouse itself on the right. And beyond both is a garden around which peacocks strut. 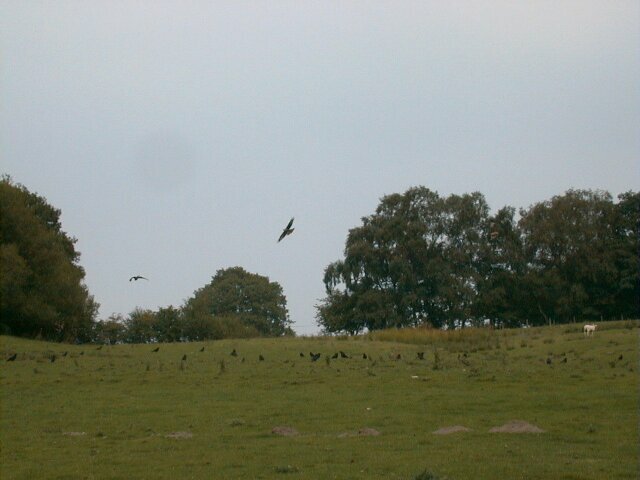 Gigrin Farm is a feeding station for red kites. Thanks to more careful farming (and thus fewer sheep carcasses littering the hillsides) as well as to hunting, the red kite (Milvus milvus) was almost extinct in Britain at the beginning of the twentieth century, but numbers had started to revive in this area before Gigrin Farm started to feed them -- with beef, at 2 pm GMT every day. That makes the event sound rather civilized; what it really means is that Mr Eithel Powell drives his tractor into the field, pulls out a sack containing 30kg of raw meat, and flings the content far and wide. 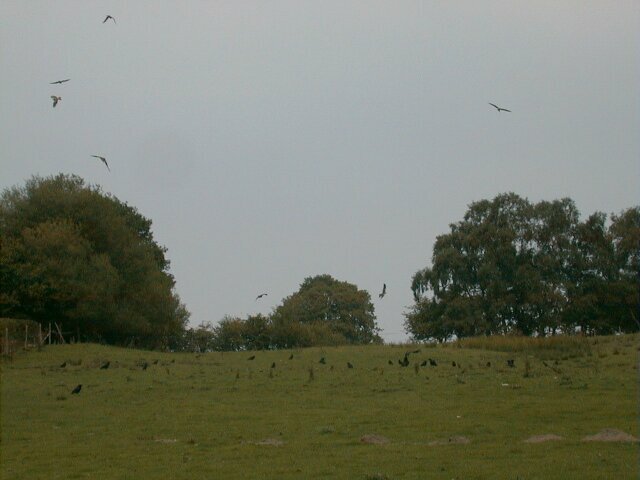 The crows can't control their appetites; the buzzards and red kites are a bit more wary. 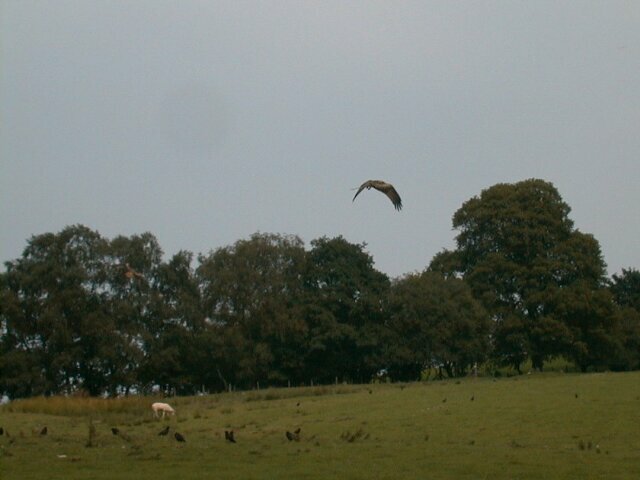 (The kites seem not to eat at all, but they pick up meat as they swoop down and eat it while on the wing.) 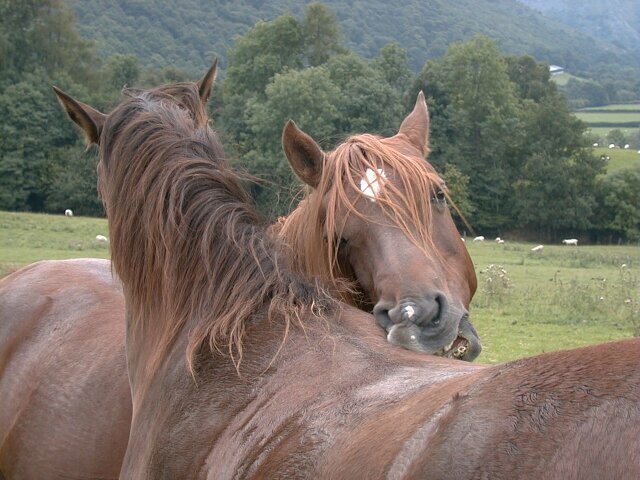 There are hides from which we humans can enjoy the meal, as it were. There were plenty of kites the day we were there. What can I say? The camera lacked a telephoto lens; more importantly, the shutter of a Nikon "Coolpix 900" is released after and not when the button is pressed; most critically, I have no experience of this kind of thing. 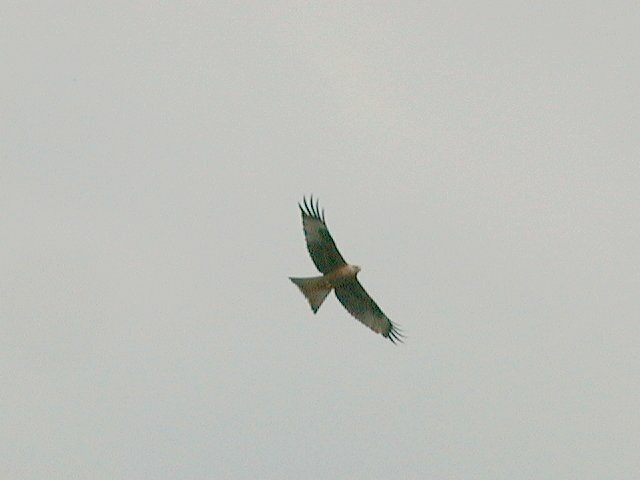 If you don't particularly need good pictures of red kites, here are my best efforts. 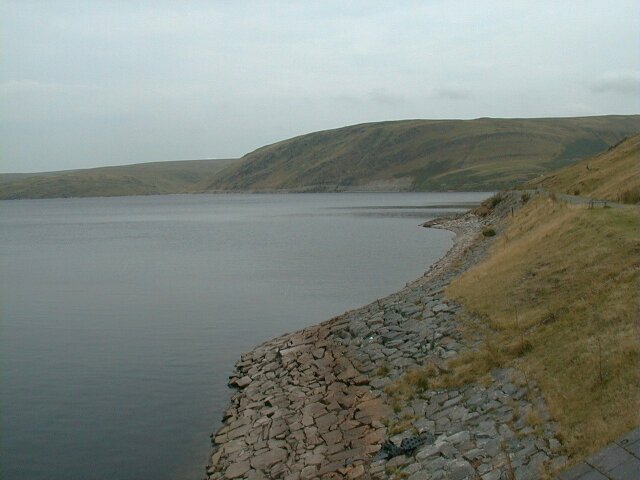 I had wanted to go to the Elan valley area of reservoirs. 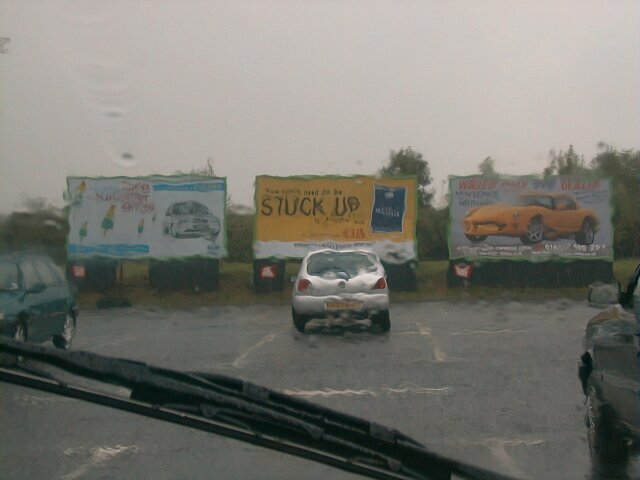 And so we did, in the cloud and drizzle. 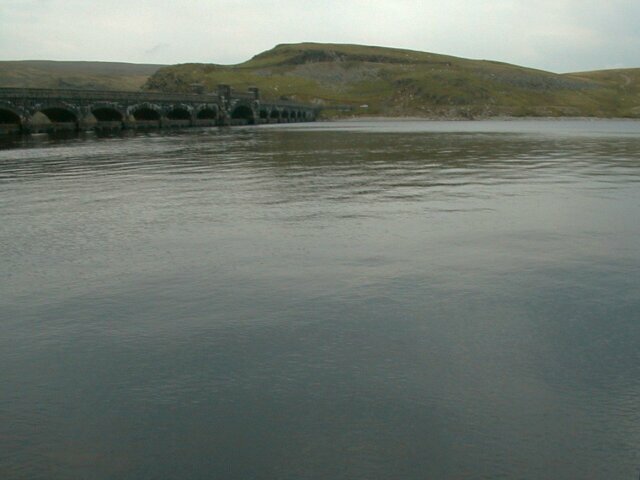 These reservoirs are all rather confusing. 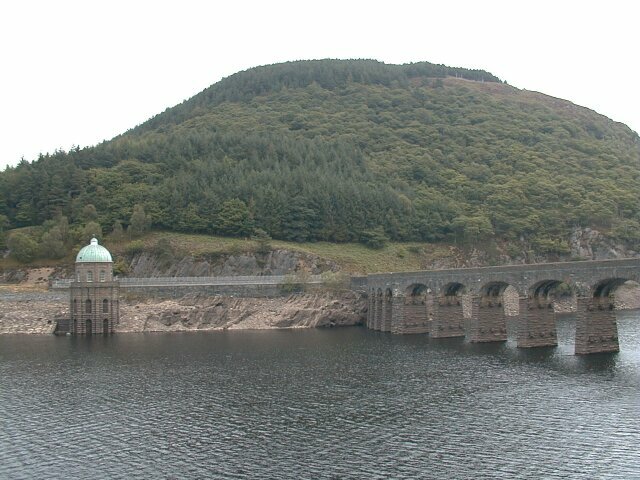 It seems that there are four dams: Caban Goch, Craig Coch, Pen-y-garreg, and Claerwen. 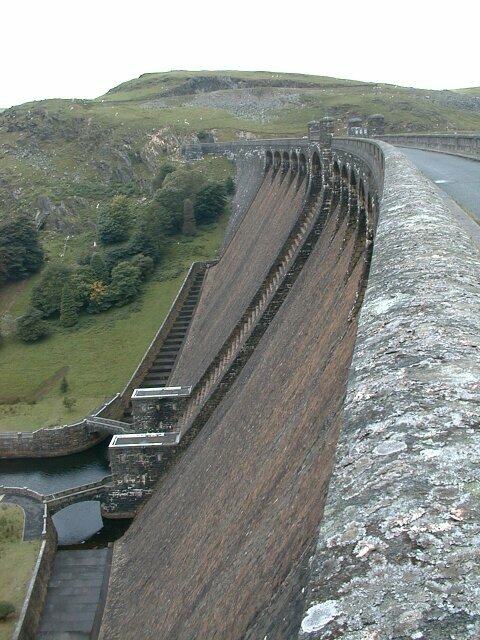 But there are also the Carreg Ddu (normally submerged, only visible during droughts) and the apparently incomplete Dol-y-mynach. And the driver is perplexed to find that neither the roads nor the rivers go in straight lines or strictly according to his road map, so it's possible to miss even the famous, unsubmerged dams. Anyway, I did. A plaque on the Claerwen dam is marked "City of Birmingham Water Department". Sure enough, this is where the good people Birmingham derive their water (well, those who don't insist on Volvic, Evian and the like). They've been doing so since 1904, thanks to water shortages (and outbreaks of smallpox, etc.) in the nineteenth century and predictions of chronic and severe shortage ahead. The water flows 117km to Birmingham, dropping by only 52 meters -- enough for pumps not to be needed. 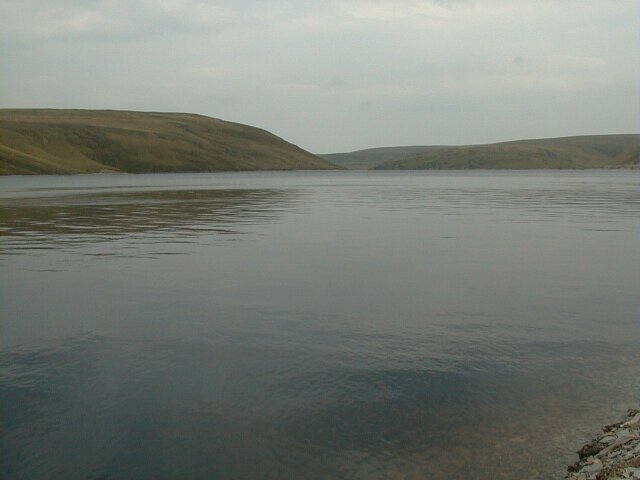 And here is the Claerwen Dam and its reservoir. This much larger dam was only completed in 1952. (The royalty-obsessed may like to know that opening this dam was Queen Elizabeth's first official duty as Queen.) The whole structure took 700,000 tons of materials and holds back 48 million cubic metres of water -- perhaps chickenfeed by Texan standards but a fair whack for Wales. Many of the facts here are derived from (or are my misreadings of) Touring the Elan Valley, written and published (1999) by S. Collard. for an entirely different view of this area, see the poem "Reservoirs" by R S Thomas; this is conveniently printed on p. 224 of the Rough Guide (1997 ed.). Hearing that a "Victorian Week" was going on at Llandridnod Wells, we rushed there to see what it was all about. As the Rough Guide tartly points out, Llandrindod Wells is a Victorian invention that is now "revictorianizing" itself. 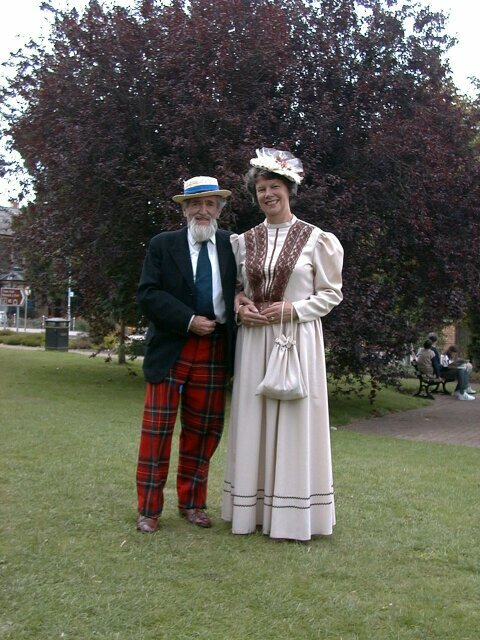 Well, the Victorian week -- or what we could see of it despite arriving very late in the day -- looks rather enjoyable. People from all over the country (as well as a contingent from Ukraine) dress up in their best Victorian duds, promenade, and enjoy more or less Victorian (or at least old-fashioned) pastimes. 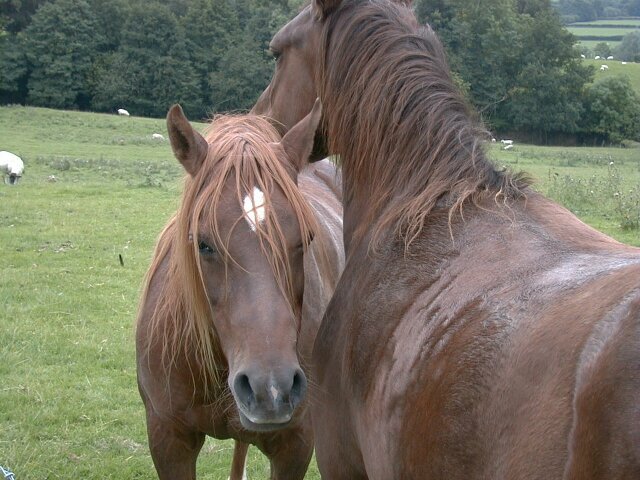 Here we see a friendly couple from . . . um, I forget. 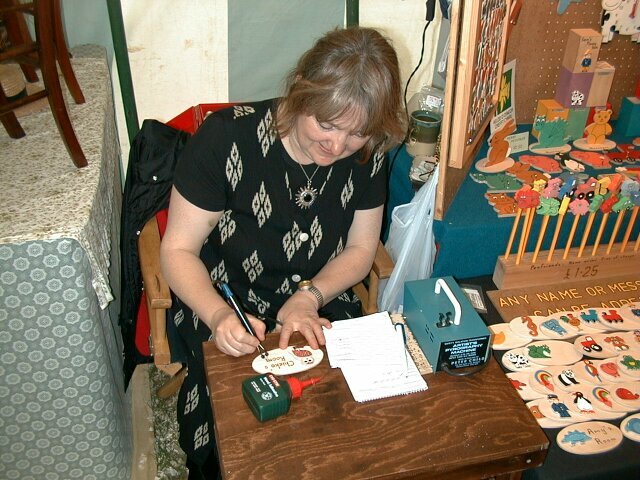 And a lady branding "Chieko's Room" on a wooden plaque -- OK, so that's not traditional at all -- in a crafts marquee. 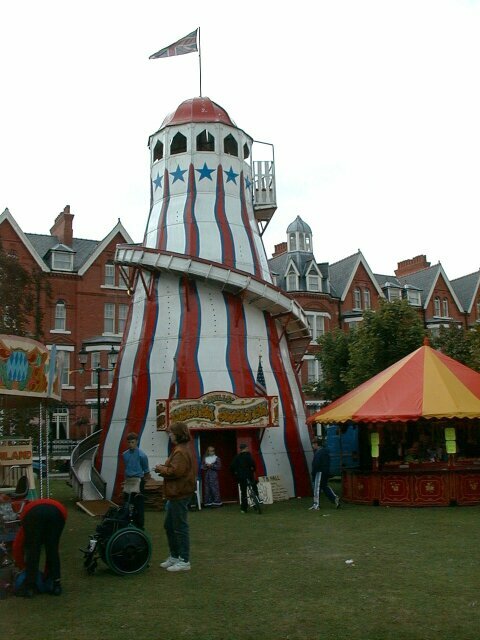 Anyway, this is a rarity: a portable helter-skelter dating from just after the war and created from recycled aircraft parts. A dozen or so survive and it takes about four hours to reassemble, if I remember right. A slight problem is that the cross-section is not circular but polygonal, so as you slide down your right hip gets a buffeting. But it's good mindless fun all the same. Pretty soon it was time to go back. We'd arrived via a rather tortuous route: off the M4 while still firmly in England, north to Hereford and then westwards. It seemed faster to go southwards and pick up the M4 in the area of Cardiff -- particularly as visibility was poor for any scenery that might otherwise be worth seeing. 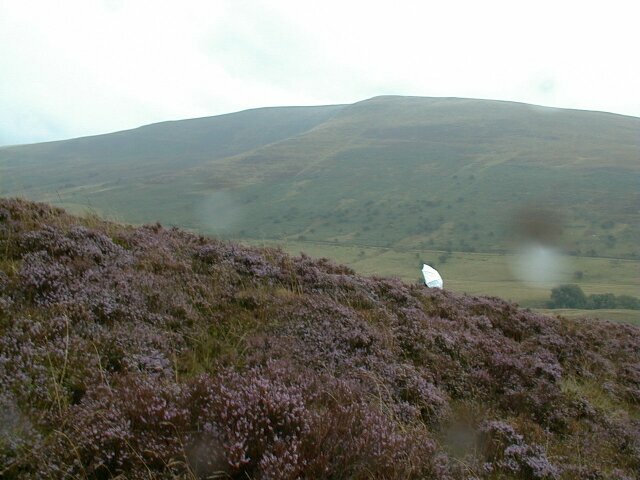 So we passed over the Brecon Beacons, where we briefly stopped the car and got our fill of gorse, stone, lichen, drizzle: just what Jan Morris identifies as essentially Welsh. And here's a view of the world taken during the return trip towards London (specifically, Uffington). 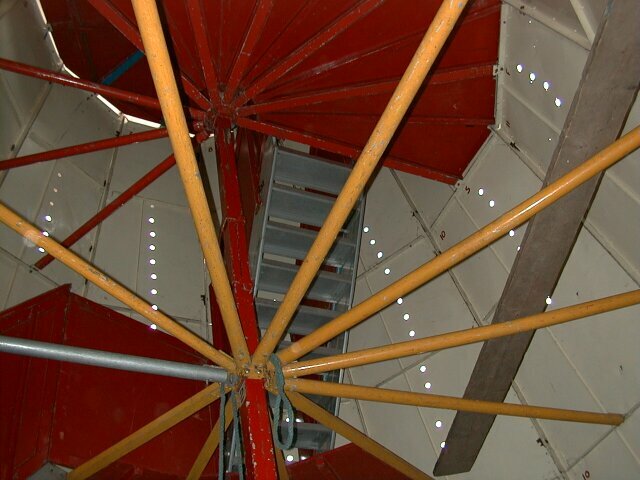 First created on 13 September 1999; last fiddled with 25 September 2000.